Do you enjoy knitting, sewing or crochet? Is arts and crafts your thing? Do you enjoy getting out and about with your camera? If you answered yes to any of these questions then Margaret Green Animal Rescue needs you! We would like to start selling handcrafted items during December and August each year. The sale of the items would raise much needed funds for the charity whilst also raising awareness as we will sell them at events across Dorset and Devon. We are looking for individuals or groups who would like to make these items and donate them to us to sell. Examples of the type of items needed are knitted or crocheted blankets, hand crafted cards, homemade aprons, cushions, bunting and any other creative item you can think of! Perhaps budding photographers could take pictures of our beautiful local countryside and donate small prints that we could sell. The choices are endless! 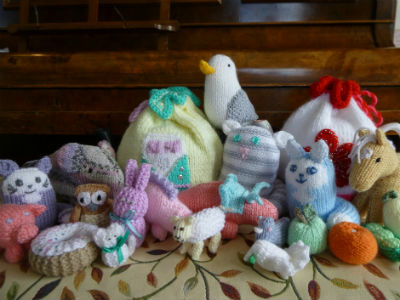 If anyone has wool or other craft items they can donate to the people who are making these items it would be greatly appreciated. We know there is a lot of talent out there so please get in touch and help us raise funds for Margaret Green Animal Rescue. Good quality teddies, soft toys and other unwanted gifts or items make perfect tombola prizes and are always in great demand! Please get in touch if you think you might have any suitable items. If there are any businesses out there who would like to donate items for raffles or tombolas, we’d love to hear from you too! Contact Nikki at or by phone on 07522 366736.